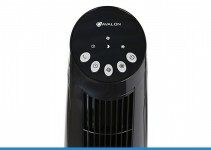 Depending on your familiarity and experience in the kitchen, a mandolin slicer is either a novelty item or else an essential device that you use on a daily basis. 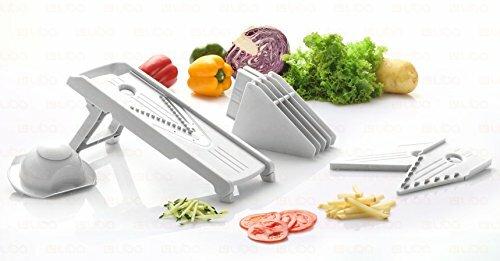 Although the best mandoline slicers come in a variety of sizes, designs, and styles, all of them are designed to create a horizontal cutting surface that cooks can use to slice fruits, vegetables, and other foods in unique and innovative ways. Chefs can use their knives to cut vegetables and other foods in a variety of ways, but creating a horizontal surface with a fixed cutting blade makes it much easier to perform intricate cuts, including the ability to create juliennes. Originally a French term, to julienne a vegetable means to cut it into long, very thin strips that resemble a matchstick. Depending on the make and model, the best mandoline slicer can also create a number of different slice styles, including crinkle cut (a wavy cut), waffle cuts (known as gaufrettes in French), and dicing. In English, the word “mandolin” originally referred to a musical instrument while “mandoline” with the “e” on the end was the culinary utensil. Over time, many professional chefs and kitchen equipment manufacturers began to drop the final “e” when referring to the utensil. In this article, we will mostly use the original spelling variant – mandoline – to refer to the kitchen slicing utensil. Mandolins give cooks a tremendous advantage when preparing food because the action of passing a vegetable or other food over a fixed blade results in perfectly uniform slices. A mandolin works by fixing a selected blade horizontally while a second horizontal plane is adjusted to determine the thickness of the slice. The first step in finding the right mandolin for your needs is by analyzing how simple it is to adjust both the cutting blade and adjusting the thickness of the resulting slices. The second aspect of choosing the best mandoline slicer is understanding exactly what type of cutting action you want to perform on your vegetables and other foods. An inexpensive mandolin with a fixed blade can easily do a great job in preparing uniform slices of durable vegetables like potatoes, carrots, and apples. If, however, you want to prepare more artisan food with greater flair, it is essential to choose the best mandoline slicer with the right selection of cutting blade types and finer adjustments for softer vegetables like tomatoes and fruits like lemons. Last, but definitely not least, is understanding the safety features to look for in the best mandoline slicer. All slicers involve pushing a vegetable or other type of food against a very sharp blade, so it is essential to ensure that there is a minimal risk of having your fingers get injured during the slicing process. Look for a mandolin slicer with quality safeguards against injury and accidents. The first step in finding the right mandolin slicer is to understand exactly what it is you want to do with your new mandolin slicer. If you expect to use it infrequently to make one or two dishes like fried potatoes or to julienne carrots for your salad, choose a simpler, more affordable model. Less expensive models may have a more cumbersome process to adjust slice thickness or swap out cutting blades, but this might be acceptable if you are only planning on using your mandolin slicer for a few regular tasks. 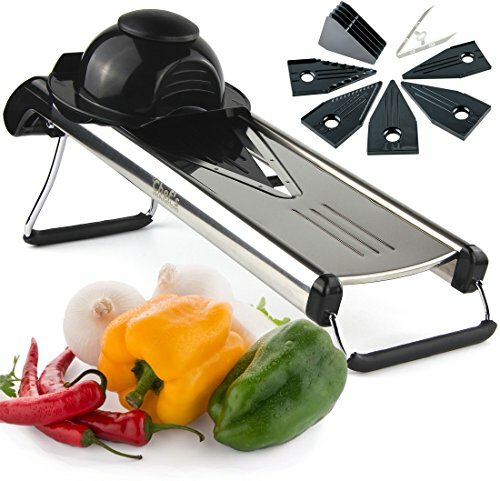 If you are buying the best mandoline slicer in order to vastly increase the number of culinary options open to you, it is extremely important that you select a mandolin slicer with all of the features that you might be expected to use. 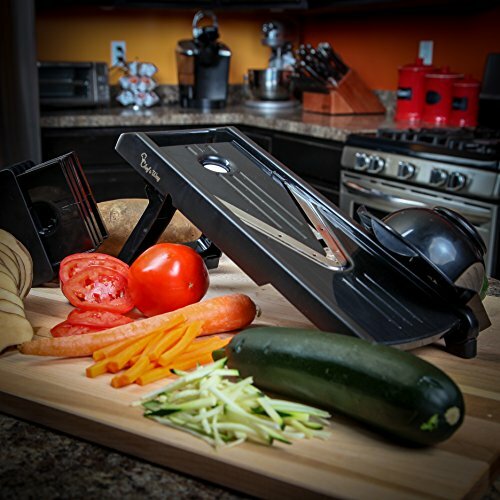 A quality, versatile mandolin slicer will have rugged safeguards that allow you to quickly and safely operate the utensil without being frustrated and tempted to bypass the safety features. In addition, a versatile mandolin will have a complete set of blades or cutting faces that are simple and easy to change and adjust. Other features to look for in a quality mandoline slicer include a rugged design that can withstand heavy use in the kitchen and a lock or safeguard to prevent injuries from the cutting surfaces when the mandolin is not in use. All mandoline slicers are manually operated, so look for a model that will be easy to handle and use without slipping or flipping. It’s also important to find a mandolin slicer that is easy to clean and maintain, an essential feature for a quality kitchen utensil that will be expected to perform years of reliable service. 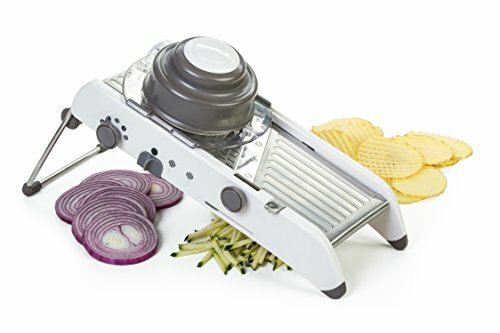 With literally hundreds of styles, makes, and models on the market, finding the top 10 best mandoline slicers wasn’t easy. We carefully reviewed the most popular mandolin slicers, judging them for their efficiency, design, and affordability in order to create this list of what we consider to be the best 10 mandoline slicer models currently available for sale. Note: although some cooks use their mandoline slicers for preparing meat, this is not recommended. The models in this review are designed solely for use with fruits and vegetables. 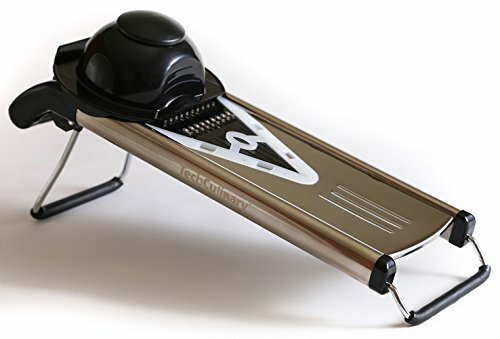 With an attractive black or orange design, this mandolin slicer from HomeNative allows cooks to easily and quickly slice fruits and vegetables in a wide variety of styles. The HomeNative slicer comes with a food container base to catch the slices as you operate the mandolin. The HomeNative comes with interchangeable blade plates to slice, grate, fine grate, and julienne all of your favorite fruits and vegetables. This HomeNative can also chop and grate vegetables as well. The HomeNative also has a safety top to protect your fingers. The HomeNative is built with a non-skid base, and the rotator lock is guaranteed to keep the blades secure while in use. Safe for use in a dishwasher, the HomeNative can be adjusted to create slices 1 mm, 3 mm, and 5 mm thick. This versatile kitchen utensil from LiBa comes with surgical grade stainless steel blades to create a wide variety of slicing styles. The plastic components of the LiBa are made from food-safe ABS plastic, and the included slice guard will safely protect your fingertips while the slicer is in operation. The LiBa mandoline slicer can juliene, slice, and grate a wide variety of foods and is designed to be rugged enough to provide years of reliable use. The LiBa comes with three slicing inserts of 1.5 mm, 2.5 mm, and 3.5 mm thicknesses as well as two julienne blades for creating cuts of either 3.5 mm or 7 mm thick. This LiBa also comes with a slicing guard that includes stainless steel prongs, and a storage rack to safely store the slicer when it is not in use. The Progressive PL8 mandoline slicer is available in either an attractive white or red design, perfect for matching the decor of any kitchen. The Progressive PL8 allows cooks to achieve perfectly regular slices in four different thickness settings, two julienne options, and one blade for waffle cuts. Special non-skid feet on the Progressive PL8 keep it from slipping while the generously wide slicing blades efficiently process even thick vegetables with ease. A rugged adjustment knob allows for rapid switching between blades and keeps the selected blade firmly in place. The Progressive PL8 comes with a secure slicing guard to protect your fingers, and the entire unit is safe for dishwasher use. Ideal for professional and home kitchen use, the Chef’s INSPIRATIONS slicer comes with five different slicing blades to achieve the perfect cut every time. The Chef’s INSPIRATIONS slicer comes with a special blade safety sleeve for extra security as well as a cleaning brush for very fast clean-up and simple upkeep. The V-blade slicer can be quickly adjusted to make 1.5 mm, 2.5 mm, or 3.5 mm slices or you can set it for 3.5 mm or 7 mm julienne slicing. The Chef’s INSPIRATIONS slicer comes with a special blade caddy to store unused blades, and the entire unit is dishwasher safe. The Chef’s INSPIRATIONS mandoline slicer has a stainless steel frame and blades to provide years of reliable slicing, and the non-slip design ensures a stable working environment. From one of the leading German manufacturers of kitchen utensils and equipment, this mandolin slicer from Mueller uses the professional chef V-shape blade design to rapidly and easily create a wide variety of slicing styles. To adjust slicing thickness or style, simply rotate the control knob. All of the blades on the Mueller are made from 420-grade surgical quality stainless steel while the plastic parts are manufactured from BPA-free food grade ABS plastic. The Mueller is dishwasher safe and comes with a lifetime warranty from the manufacturer. 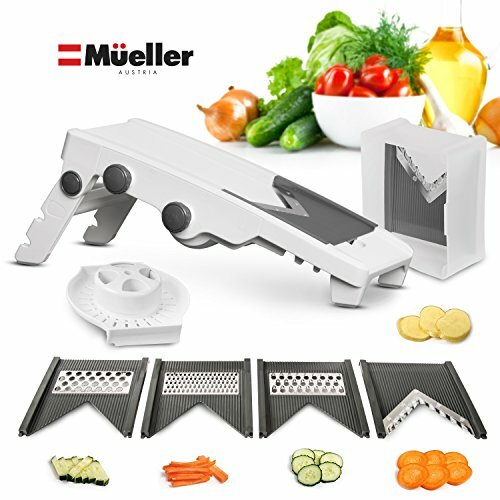 The Mueller comes with five different blades for slicing, julienne cuts, grating, and perfect cross-cuts. This professional quality mandoline slicer from Zira has interchangeable blades to allow chefs to cut, peel, grate, and julienne slice with ease. 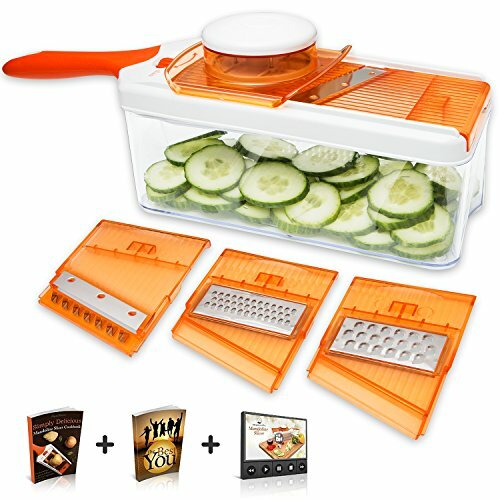 The Zira mandoline slicer comes with four interchangeable blades, a safety holder, and complete instruction manual. This Zira comes with a container base that safely and cleanly collects the sliced vegetables and other foods as you prepare them. 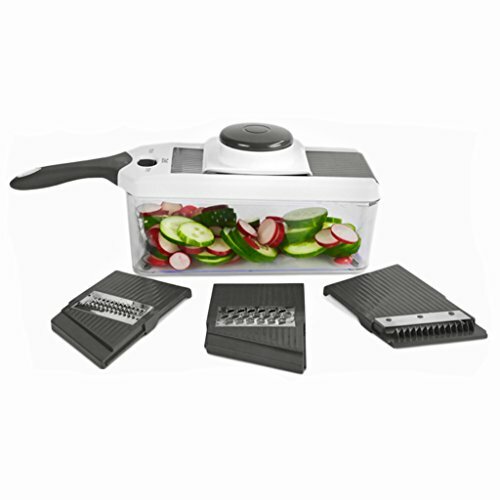 The Zira slicer is designed to cut, peel, chop, and grate vegetables and fruits as well as grate cheese. Another feature of the Zira is a non-slip base rated safe for dishwasher use. The Zira mandolin can cut fruits and vegetables in 1 mm, 3 mm, or 5 mm thickness slices. With an attractive all-white design, the Swissmar V-1001 can elegantly and safely slice fruits and vegetables in a variety of different ways. The Swissmar V-1001comes with surgical-grade stainless steel blades made in Germany that can julienne, shred, and slice foods paper thin or more thickly with the included 3.5 and 7 mm blades. Designed for ambidextrous use, the Swissmar V-1001 comes with a rugged safety guard that includes prongs for extra security. 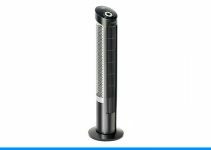 The Swissmar V-1001 comes with a caddy that can be stored flat or hung on a wall, designed to hold all of the components and blades when not in use, and can be easily cleaned by rinsing under running water. With an attractive colorful design, this complete food slicing utensil from Kainnt cleanly captures sliced food in a transparent container. 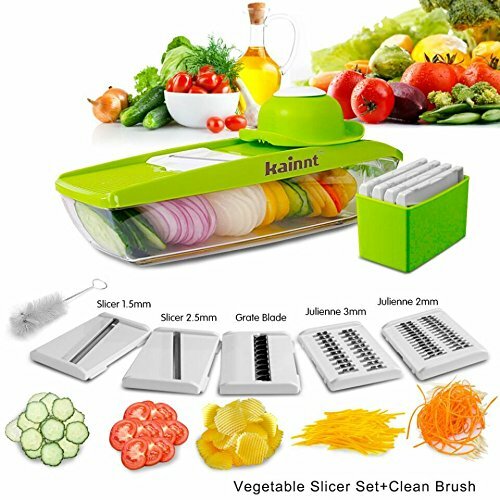 The Kainnt comes with five interchangeable stainless steel blades to easily and efficiently julienne food at 1.5 mm, 2 mm, 2.5 mm, and 3.5 mm thicknesses or you can choose to grate/shred vegetables, herbs, and cheeses. 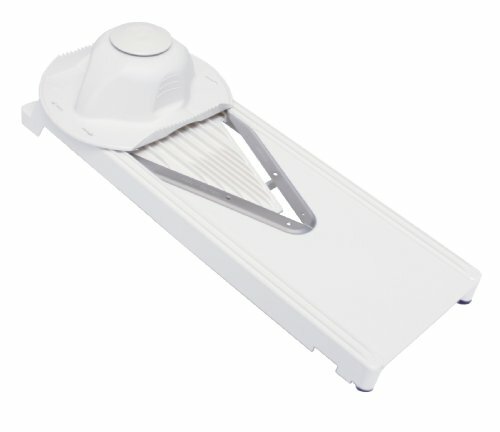 The Kainnt mandoline slicer also comes with a cleaning brush, using BPS-free ABS food-safe plastic for long-lasting reliability. All of the components of the Kainnt slicer can be safely stored in the included food container when not in use. This attractive mandoline slicer from TechCulinary is available in either black or green and features six different blade inserts. Using the TechCulinary slicer, it is possible to create 3.5 and 7 mm julienne cuts, 1.5 mm, 2.5 mm, and 3.5 mm straight slices, or use the included 1.6 mm grater blade with cheeses, herbs, and vegetables. The cutting edges of the TechCulinary are made from top grade stainless steel and the entire unit is dishwasher safe for easy clean-up. 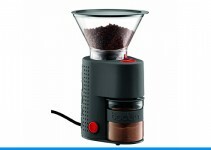 The TechCulinary comes with a safety handle for additional security, a blade guard, and slip-resistant rubber footing. The TechCulinary also comes with a storage rack for unused blades, and the foldaway feet on the base of the utensil make it very easy to store. This sleek mandolin slicer from Chef’s Way comes in an attractive black design. The Chef’s Way slicer comes with a special cheese slicer, as well as a chopping, straight slicing, and julienne blade for maximum culinary versatility. Using a professional V-shape design, the Chef’s Way slicer will quickly and efficiently prepare a variety of vegetables, fruits, and herbs to the ideal thickness with every pass. This Chef’s Wayslicer is designed to be easily cleaned under running water, and comes with a storage rack for safekeeping the blades when not in use. The Chef’s Way mandoline slicer comes with a a lifetime warranty from the manufacturer and comes with an instruction manual that includes tips and recipes. This slicer can slice foods at 1.5 mm, 2.5 mm, or 3.5 mm thickness as well as julienne foods at either 3.5 mm or 7 mm in thickness. The Chef’s Way slicer also comes with a slicing guard that uses stainless steel prongs for added security.